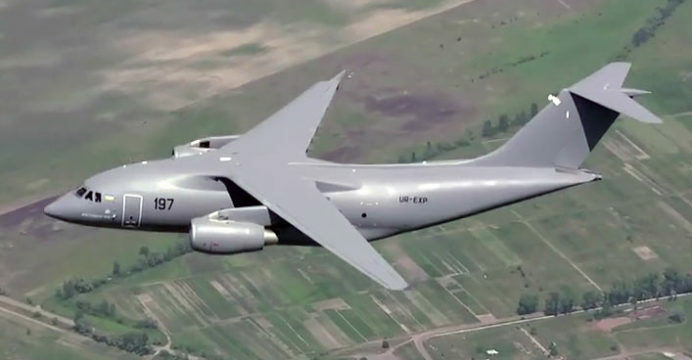 Ukraine’s state-owned enterprise Ukroboronprom is marketing the Antonov An-178 military airlifter to prospective clients in the Middle East, starting with Kuwait, Interfax Ukraine and Defence Blog report. The Antonov An-178 is based on the An-148/158-series of regional jet airliners and is designed to replace legacy short/medium-range transport aircraft, such as the Antonov An-12 Cub. When Antonov revealed the An-178 in 2015, it explicitly stated that it was aiming to provide a markedly cost-effective solution, especially in comparison to comparable Western aircraft. Antonov also promised to expand the An-178’s versatility, such as adapting it for the air-to-air refueling (AAR) role. However, as with many of Ukraine’s marquee defence programs, the An-178’s success seems to be hinged to Kiev’s success in securing an overseas partner to co-fund and induct the platform. The An-132D came to fruition as a result of Saudi Arabia joining and co-funding the program. In May of this year Ukroboronprom signed a memorandum-of-understanding (MoU) with Turkey’s Aselsan to provide an integrated avionics suite for the An-148-family, which includes the An-178. In 2016, Antonov had posited the option of integrating General Electric or Pratt & Whitney turbofan engines in place of the Ivchenko Progress D-436, which currently powers the An-178. Antonov intends to secure sales for 20 An-178 aircraft for the next five years. Its target markets include Central Asia, South Asia, the Middle East and North Africa, Sub-Saharan Africa and Turkey. Having first flown in May 2015, the An-178 can carry 15 tons in payload to a range of 2,040 km (and at 18 tons 990 km). It is powered by two Ivchenko Progress D-436 turbofan engines, which Antonov claims will provide lower operating costs than four or even turboprop engines. The An-178’s main competitors in its category are the Lockheed Martin C-130J/LM-100J Hercules and Embraer KC-390. While the Hercules and KC-390 each possess greater payload capacity, Antonov can pitch the An-178 as a niche short-haul heavy transport aircraft. Air arms with limited or non-existing long-range transport requirements could use the An-178 for heavy payload tasks. Alternatively, countries with C-130-class (and/or larger) platforms can use the An-178 to handle domestic logistics transport work.